As a child, Grinberg would ride her bike to the local university campus on the weekends and gaze into the large windows of the chemistry department’s laboratories. She would wonder if maybe someday, she too, would call herself a scientist. Now years later, her childhood curiosity has turned into a career. 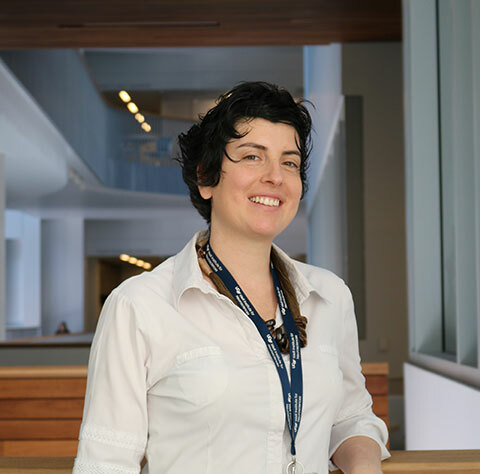 Grinberg is a neuropathologist and an Associate Professor in Residence of Neurology and Pathology at the UC San Francisco Memory and Aging Center, where she oversees her own Grinberg Laboratory. The team at Grinberg Laboratory consists of 20 individuals that she oversees and works with. They study donated human post-mortem brains to discover therapies for neurodegeneration diseases like Alzheimer’s, dementia, and sleep patterns. While many researchers focused on human neurodegeneration use animals or other cells to draw research conclusions, the Grinberg Laboratory uses actual human brains. Brain diseases like Alzheimer’s develop in the brain 20 years before they are detectable, but the Grinberg Laboratory has found that signs of the disease can be noticed sooner through symptoms like depression and irregular sleeping patterns. These symptoms precede five years before patients have memory loss by first attacking the dorsal raphe, which is located in the brainstem. This new knowledge helps identify how the disease develops, spreads, and allows them to find a treatment that will curb disease progression, with hopes to prevent memory loss and lower the current number of 5 million people who suffer from dementia in the U.S.
“My research is translational, so that means I would like to see the research I am doing now impact patients as soon as possible,” Grinberg said. The laboratory uses advanced computing methods to transfer molecules studied under a microscope into a digital three-dimensional image where they can reconstruct and study the brain. “I began my research fifteen years ago and with the advancement of the equipment brought on by robotics and microscopes, I now feel better equipped to provide better results,” Grinberg said. Another way Grinberg said she has helped contribute to finding cures for diseases is through mentoring fellows, interns, and others that work in her laboratory. She said getting the right people in the right field sooner will help find cures quicker. Grinberg has also recently become involved with the Institute for Computational Health Sciences, which is comprised of a team of investigators interested in computing and data science and the Global Brain Health Institute, which a large project focusing on promoting equity in brain health across the world . In addition to her UCSF roles, Grinberg has served for the past two years as the head of the Human Brain Protein project, an international group of individuals across Asia, Europe, the Oceania region, and the U.S. interested in proteomics in the brain. Grinberg is a visiting scientist at the Computer Department at the Lawrence Berkeley National Labs. Separately, she is the head of the Human Validation Core for the NIH-funded Center Without Walls for Tau biology, where they validate results from animal and cell research in humans. Before embarking on these accomplishments at UCSF, Grinberg obtained her training from institutions in Brazil, USA, and Germany. Grinberg received her doctor of medicine degree in 2001 from Faculdade de Ciencias Medicas da Santa Casa de São Paulo in São Paulo, Brazil. In 2003, she founded the Brain Bank of the Brazilian Aging Brain Study Group at the University of São Paulo, with colleagues from other disciplines. While Brazil had the same proportion of patients with dementia as the U.S., it was unknown what was causing dementia in Brazil. Through the studies of the Brain Bank, Grinberg and her colleagues found that many in Brazil had dementia due to diseases that affect people who do not have access to health care: high blood pressure, high cholesterol, and diabetes were the same symptoms present in patients with dementia. Fortunately, these symptoms could be prevented, which could lower the number of patients with dementia in Brazil. Now, the Brain Bank has become a highly regarded institution with over 4,000 brains, serving researchers worldwide. Currently, Grinberg is an Affiliated Professor of Pathology at the University of São Paulo, besides being still actively involved in the Brain Bank, and participates in the scientific board. Grinberg completed her residency in pathology in 2005 and a PhD degree in neuropathology in 2006 from the University of São Paulo that included training at the Washington University in St. Louis, Missouri. From 2007-2009, she went to the University of Würzburg in Germany for her post-doctoral studies, where she was sponsored by the Alexander von Humboldt Foundation. There she attained experience in neuroanatomy and three-dimensional brain reconstruction methods, and then worked on a study focused on brainstem nuclei vulnerability in the early stages of Alzheimer’s and frontotemporal lobar degeneration. Before coming to the U.S., Grinberg worked at an internal medicine practice in Brazil, where she saw patients twice a week. Then, she came to UCSF in 2009 and that same year she was the recipient of the UNESCO-L'Oréal Award “For Women in Science.” Then, in 2010 she received the John Douglas French Alzheimer Foundation "Distinguished Research Scholar Award” and in 2013 she became the chairwoman of the HUPO Brain Proteome Project. Grinberg said there are many reasons she has stayed at UCSF, but there are three reasons that stand out including: UCSF’s ability to be at the forefront of research, a supportive environment that has helped her adjust, and the collegial atmosphere that is present at the Memory and Aging Center. “It is difficult to go to a place that is better than UCSF in terms of research being done and I am hearing these same words echoed from other faculty here,” Grinberg said. Outside of research, Grinberg joined the Biomedical Sciences Graduate (BMS) Program. No day looks the same for Grinberg. Shes averages a week of travel monthly to conferences or collaborator meetings. Grinberg is involved in faculty life at UCSF is through her Academic Senate committee involvement. She has served on the Committee on Research (COR) as a member for four years and has been the current vice chair for almost two years. Grinberg said that COR helps faculty move into leadership positions on the committee by training them through methods like shadowing, which helps faculty not become lost in translation when moving into leadership roles. Through research collaborations, Grinberg has been able to meet other faculty who serve on different Senate committees. She said other faculty voice the same care about Senate participation. For this reason, Grinberg thinks it is beneficial for UCSF faculty to be involved in the Senate.